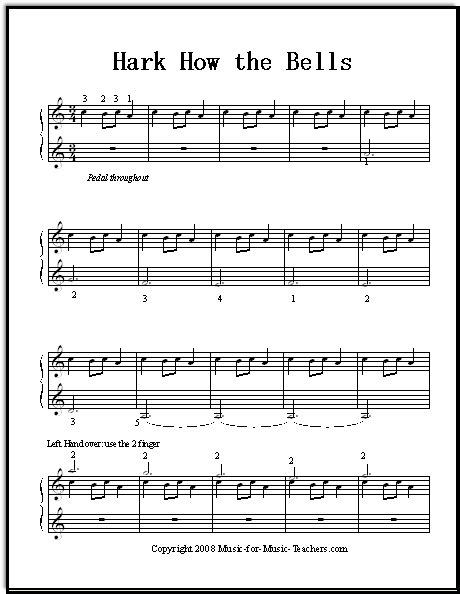 Christmas sheet music for piano - songs and music for beginner all the way through late intermediate ability. 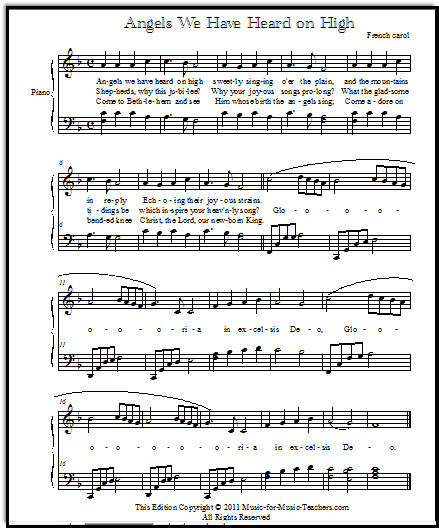 Many of these carols and songs are energetic and fun to play, and some of them are also beautiful! With a NEW piano arrangement for intermediate students. 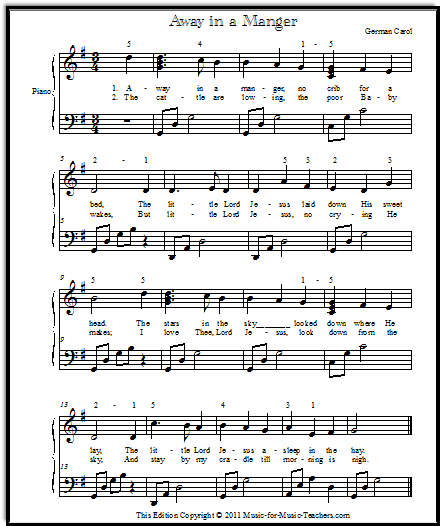 This carol is also offered as a lead sheet in several keys, with just one chord! Good chord practice for your young students. This lovely carol stretches young pianists just a bit, in the chorus. Fun to play and sing! Very evocative, very hypnotic, this Arab Dance from Tchaikovsky's "Nutcracker." This is an early intermediate arrangement. You can see how different this arrangement of Arab Dance is from the one above; pretty easy, yet still with some challenges for those Middle C notereaders, and still mysterious sounding! An easy but pretty arrangement for piano students moving into left hand broken chord patterns. A little bit of right hand chord usage, but every one is an easily-recognized root chord. A fun, bouncy energy characterizes this sweet carol from France. As it is a translation, you will certainly find different versions of the lyrics in English. Several arrangements on this page, including a Middle C shared-hands version. A very simple approach to Carol of the Bells. However, if your student is not a "leftie" (left-handed), this little motive will be tricky the first week to achieve correctly! 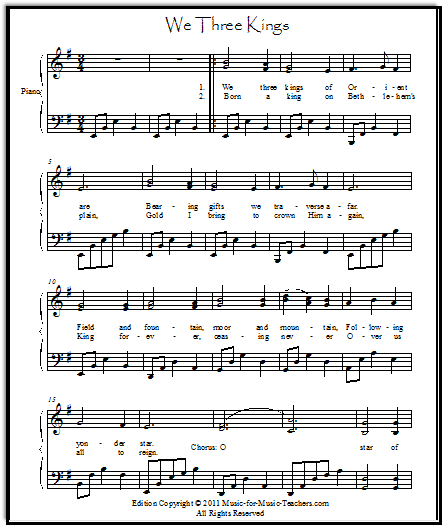 See a fuller arrangement below, or at the link "Hark How the Bells." No lyrics to this lovely lullaby, but a lilting, unusual melody. Three "verses" grow in intensity of left hand energy, while the right hand melody remains uncluttered. 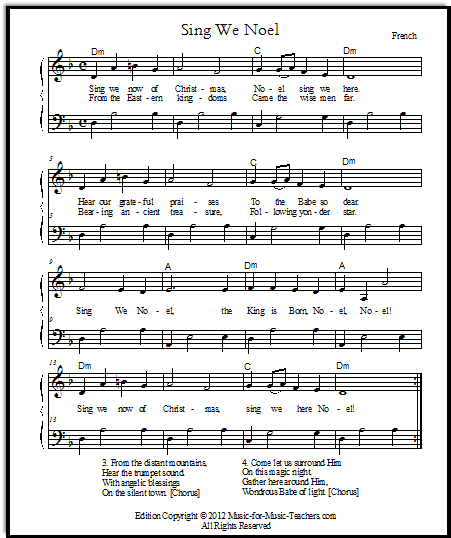 This little carol can scoot right along, with the fixed left hand chords. A good practice piece for chord inversions - the left hand moves through a cadence pattern. A minor-key song about the slaughter of Bethlehem's baby boys under the first King Herod, during the time of Jesus's infancy. Who would want to sing or play this song? Students who have heard this beautiful song before and are mesmerized by the music, despite its heart-breaking story, or those who have knowledge of this history already. This is such a fun carol! 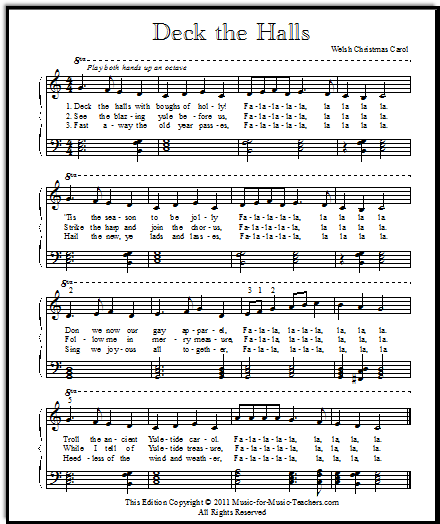 Understanding how chords are made makes a big difference in how easy it will be to learn this Christmas carol. One of my young students picked up the left hand in a snap, because she is used to the cadence inversions found on my sheet "The 12 major scales." A pretty carol that has energy. A French carol, with a new English translation. It is a description of the Nativity of Jesus. Several different chord arrangements, and different keys offered. This song is easier than it sounds, because the melody proceeds just like a major scale. This song is a discussion among the animals present at Christ's birth, each remembering the role they played. Arrangements for guitar, and lead sheets too. 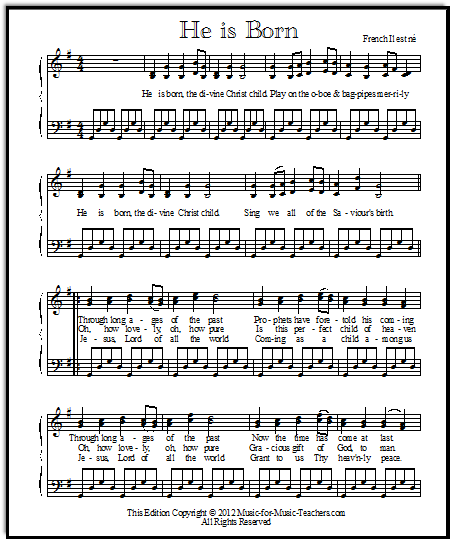 A very old Latin hymn that means "Rejoice!" Find here a pretty arrangement for guitar also. An easy and short version of this well-known Christmas song. 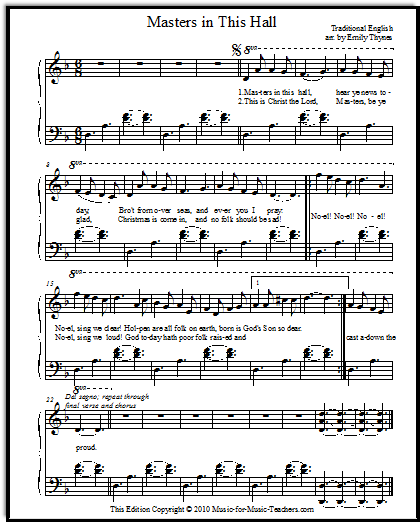 Several arrangements of this vigorous Christmas song are here. Difficult to play if all the usual chords are used, this arrangement sounds full without having to be continually changing left hand chords. Your students who learn chords will be able to play this accompaniment LONG before they are ready to read the notes. This is a duet in which the student plays broken chords up high on the piano, and the teacher (or duet partner) plays a very full-sounding melody plus accompaniment. With or without lettered notes. A full-sounding but simple solo version of Greensleeves. Arrangement by Tabitha, from the Netherlands. A very satisfying three-page easy arrangement of Carol of the Bells (Ukrainian Bell Carol) that sounds much harder than it is. Hold the pedal down, and this song will SPARKLE! 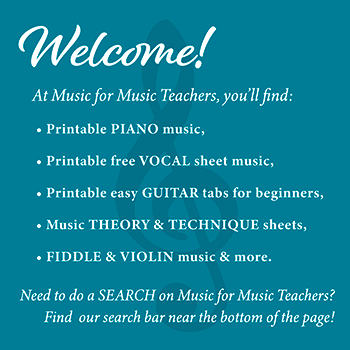 Download a Middle C version for beginners, and guitar tab arrangements. Also a sheet with just the lyrics to this song. More than one arrangement of this French Christmas carol. 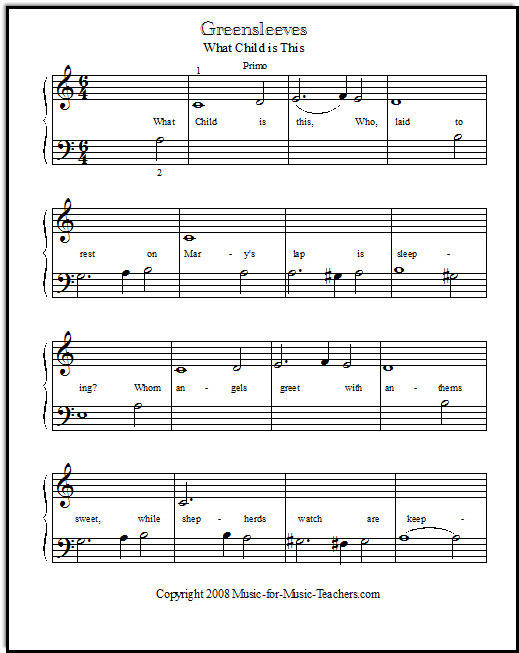 Excellent opportunity for vocal harmony exists in this song - the alto line is quite easy! Several levels of difficulty for this older English carol. Many have not heard this pretty Christmas song! Very easy arrangements of Jingle Bells, a favorite song with beginning musicians, whether it is Christmas time or the middle of summer! Two longer arrangements, one easy and one intermediate level, which include the "Dashing through the snow" beginning section. 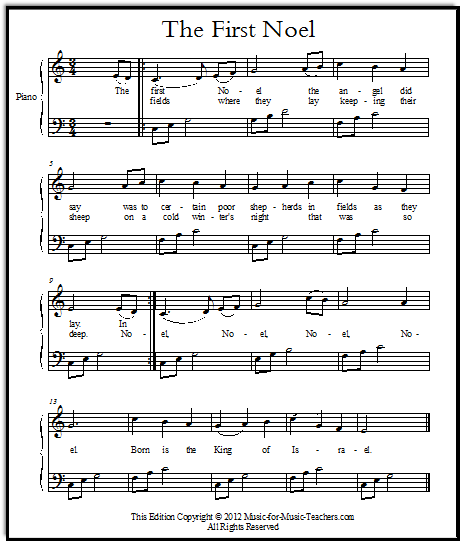 This song has a secondo duet part, and also a version with letters in some of the notes. It can sound brisk and upbeat, or sweet and sentimental, depending on how fast you play it! The words of the angel to Mary, and her response. "Here asleep the Son of God, and the son of man... Heav'n and earth within him stand! Alleluia." An old song from England, about how God has helped mankind. It has an exciting, soaring melody. With new arrangements for beginners and intermediate piano. Arrangements for piano and guitar. This is a recital-worthy arrangement, shown here. A pretty interlude with lots of movement contrasts with the somber main theme. A solo for younger players. NOT EASY, but attainable for beginners if they read carefully. There is a secondo part to go with this. 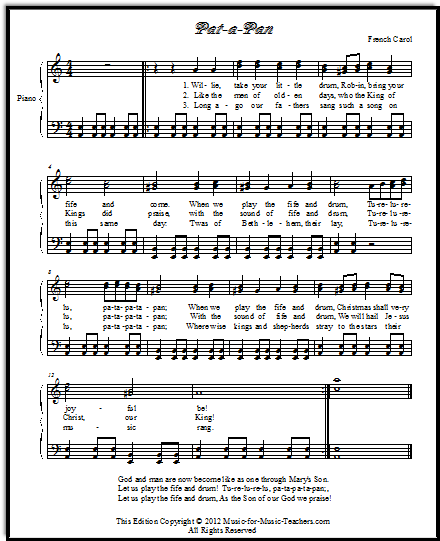 Lead sheets, a vocal duet, and a piano arrangement of this beloved Christmas song. 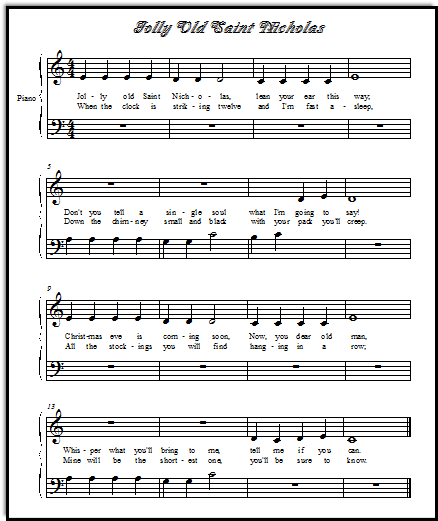 And with such cute lyrics: "Willie, take your little drum, Robin, bring your fife, and come!" Is this everyone's favorite Christmas carol? Maybe. I only know that I feel a calm descending upon me, like a soft, warm blanket, when the chords of "Silent night, holy night," begin to play. 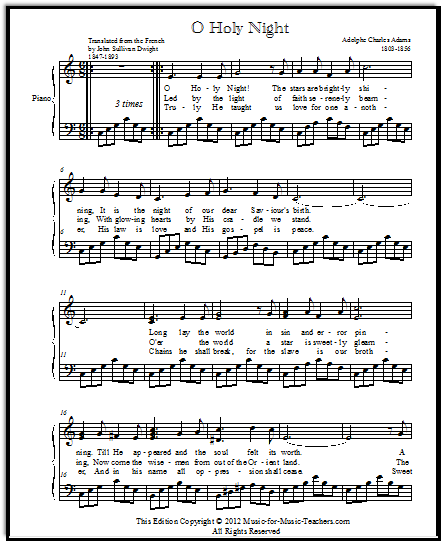 This is that rare thing, a beautiful and UNFAMILIAR Christmas carol. Ukrainian Bell Carol, or "Carol of the Bells," or "Hark How the Bells"
Your students may fight over this sparkling arrangement, to play it at a recital - IN SPRING! Just the three main chords in the left hand make this fairly easy to put together! There is also a Middle C arrangement (shared-hands melody) here. Such a pretty and mysterious carol! I loved this song as a child. Several arrangements on this page. 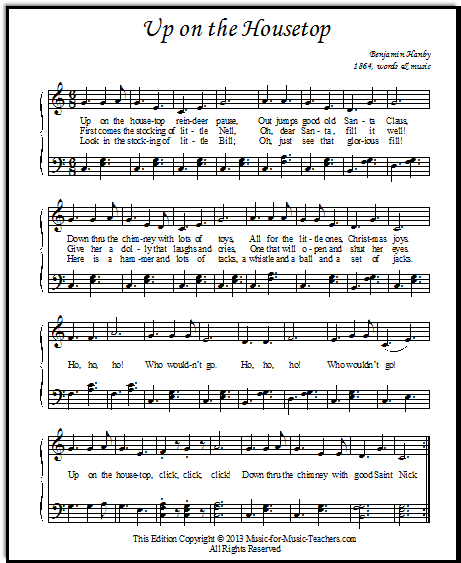 Several arrangements of this fun and energy-filled carol with the intriguing lyrics about "figgy pudding." Virtually unknown, this is one of the prettiest and most moving carols I know. It tells the Nativity story very well. 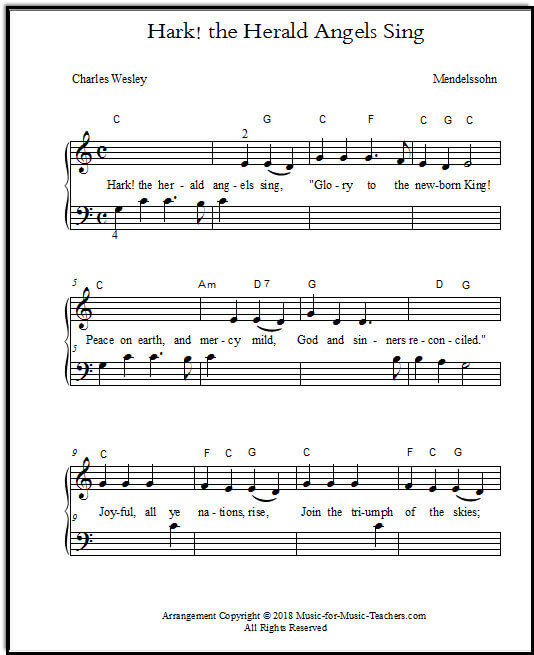 "What Child is This" is a Christmas song set to the melody and chords of an older song from the time of King Henry the Eighth, Greensleeves. A "teacher's part" on the bottom two staffs, and the student's part with simple broken chords above. This is the "Greensleeves" melody. I'm betting you do not know this beautiful song. No lyrics, but there are two difficulty levels.